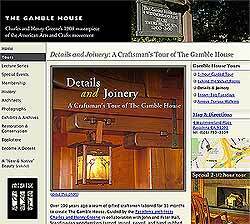 Most of you reading this article will be familiar with these most famous of architect brothers from Pasadena, Charles and Henry Greene, who are widely considered to have made one of the greatest contributions to the American Arts and Crafts Movement. Of special interest is a craftsman tour "details and joinery" by Jim Ipekjian which shows from a craftsman's point of view how The Gamble House was crafted. In which he discusses why woods were chosen, and explains joinery techniques, and explores the thinking and collaboration that led to the actual craftsmanship. 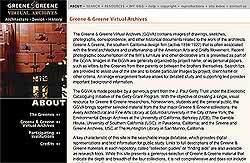 The Greene & Greene Virtual Archives (GGVA) contains images of drawings, sketches, photographs, correspondence, and other historical documents related to the work of the architects Greene & Greene. The Arts and Crafts Movement started originally in England as a search for authentic design and decoration and a reaction against the overly ornate styles that had developed out of the new age machine-production. Charles Green interest in the English Arts and Crafts Movement grew during visit to England. The Arts and craft furniture typically is simple in form, without superfluous decoration, often showing the way they were put together. Following the idea of "truth to material", preserving and emphasizing the qualities of the woods used. This can be seen in the work of Greene & Greene . Greene & Greene office was at its peak during the years 1902-1910, with primary focus on residential design. It was during this period that they created some of their finest work. By 1903, Greene & Greene began providing design and construction supervision of furniture and other interior details. In 1908 they designed what is considered by many to be their master piece The Gamble house.